We were having problems maintaining our lawn. In anticipation of increased water restrictions, and also wishing to reduce the workload of maintaining a lawn in our retirement years, we decided to make a change. We looked in the yellow pages, spotted “Naturally Maintained”, examined their website, made a phone call and everything that followed suited us to a “T”. Installation was in July and August. At the time of writing this we are now starting our second full growing year. 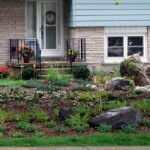 All of the plants and shrubs (approx. 500) have survived and are growing. 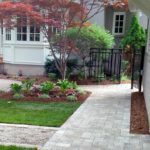 Of course we will still have the usual spring clean up, but our main job is to watch the plants & shrubs mature and flourish – no lawn watering, no lawn mowing no pesticides (what little lawn there is requires very little maintenance), and the plants are drought resistant. 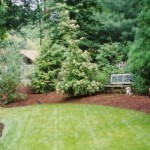 With the help of mulch in the spring, weeds are few and moisture is preserved. Our expectations have been exceeded! The only things that aren”t growing are the stones and rocks! !